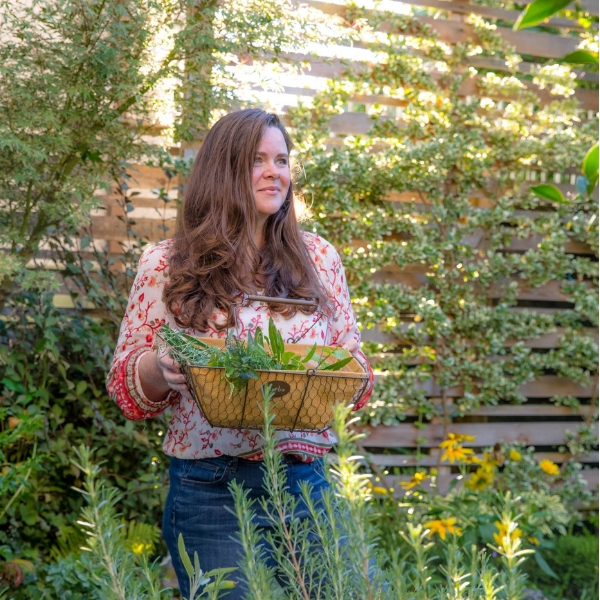 The best way to preserve the beauty of the garden is with a flower press. 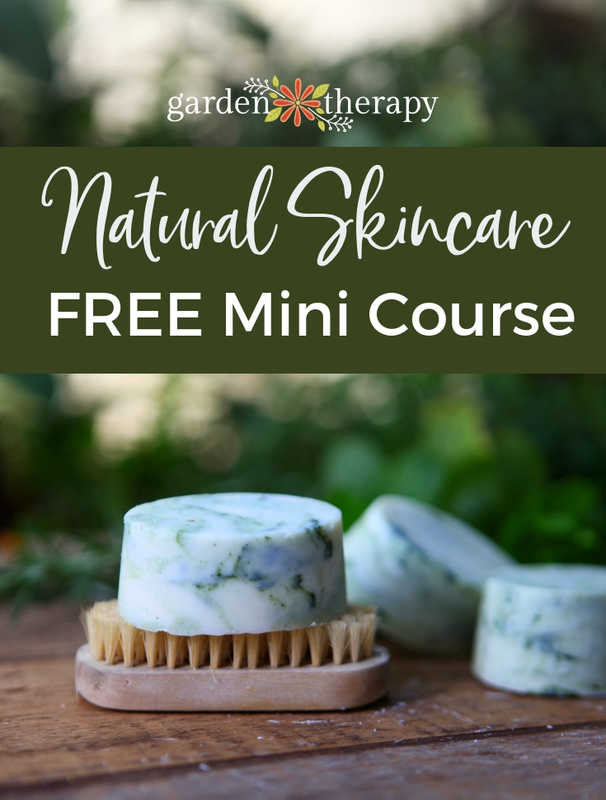 With just a few materials and tools, you can make your own that looks as beautiful as it is functional. 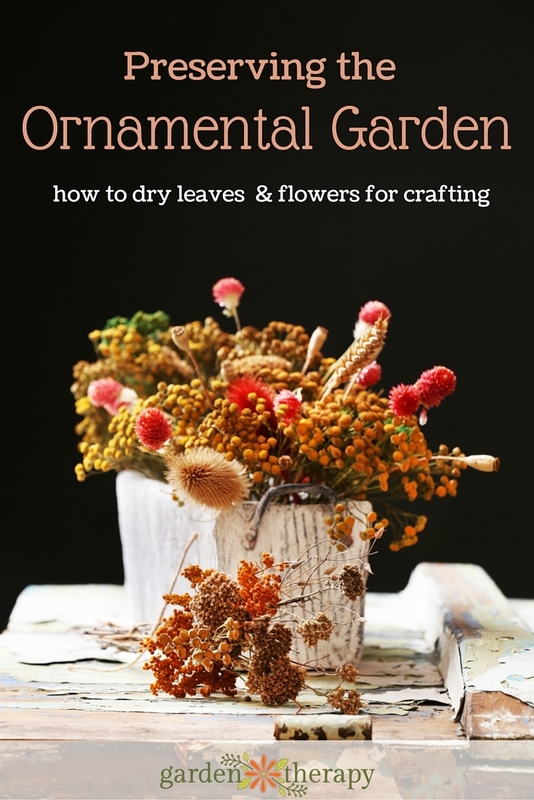 You can certainly preserve flowers and leaves in a book, a method that works well and is explained in this article. 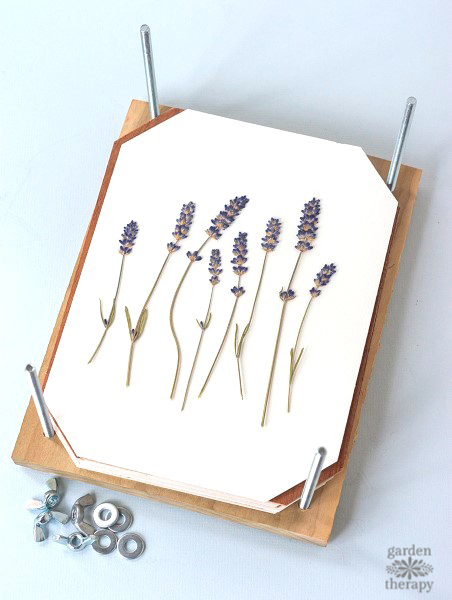 For those of you who want to take your crafting to a whole new level, a flower press will give you the most pristine and perfect dried flowers to create your artwork. Last summer, I grew violas for the first time. 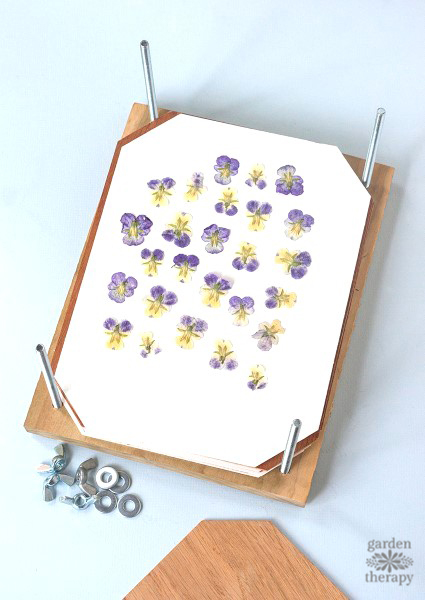 They are such pretty flowers, I decided on a whim to press some between a few heavy books. 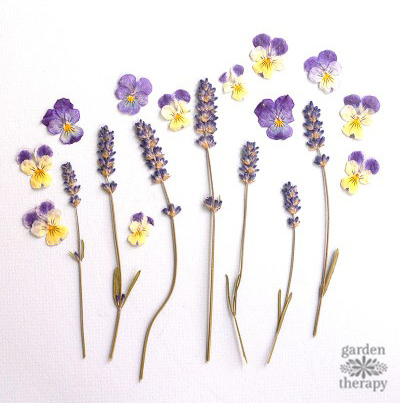 Those pressings turned into a favorite summer activity and I soon had quite the collection of pressed flowers and leaves from my garden. This year, as I plan my garden planting, I’ve also decided to prep for more pressings by making my own handmade flower press. 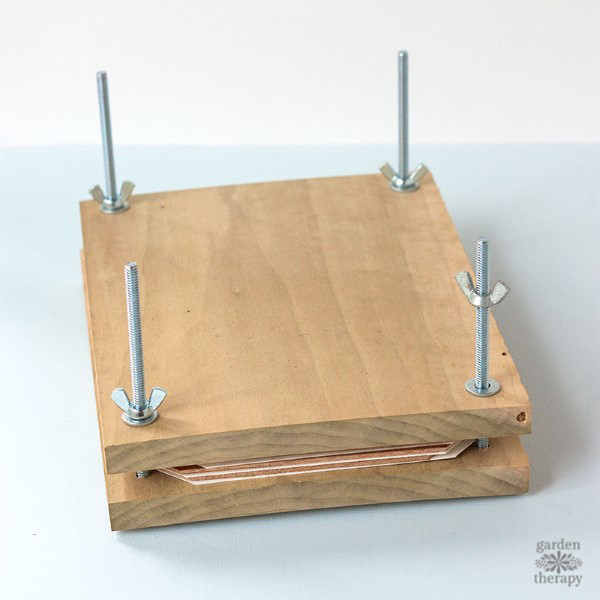 Luckily, my grandfather has a woodworking shop so I stopped by one afternoon and we made this flower press together. 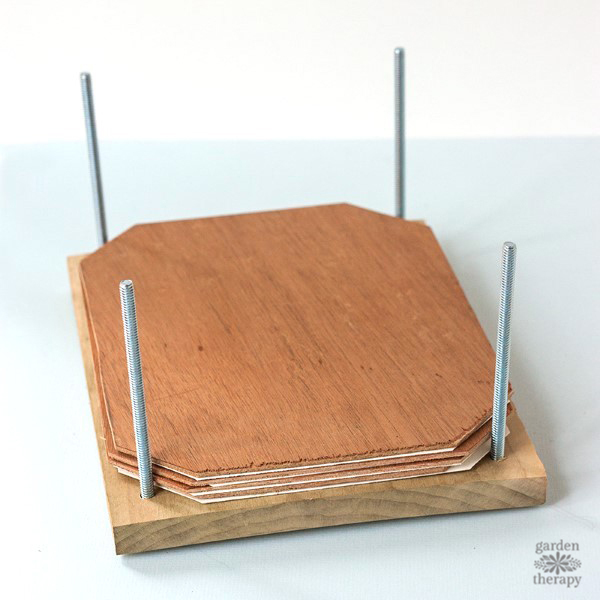 First, cut your wood to size (you can make your flower press any size you want!). I made mine approx. 8″x 10″. Then, with the two pieces of wood stacked together, drill a hole through each corner (all the way through both pieces of wood). Use sandpaper to smooth off any rough edges. Note: Make sure to choose a drill bit that is the same size as your bolt. I recommend drilling a test hole (using a scrap piece of wood) and making sure the bolt slides through the hole easily. Next, cut your cardboard to size. My grandfather happened to have a piece of very thin wood on hand, so we decided to use that instead. 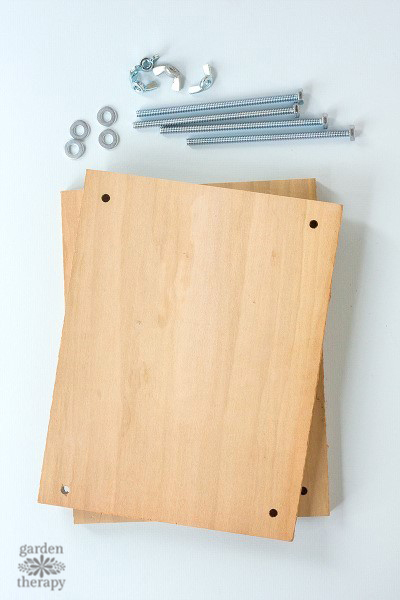 Cut your cardboard/wood slightly smaller than your 2 boards. Then cut off each corner so that it will fit inside the bolts. 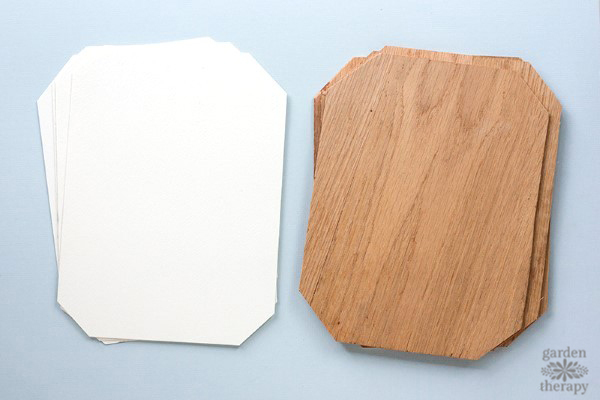 Use a piece of the cut cardboard/wood as a guide for cutting the watercolor paper (or white paper) to size. Note: I don’t recommend using paper towels (instead of white paper or watercolor paper) as the texture of the paper towel will be imprinted into your flowers while pressing. 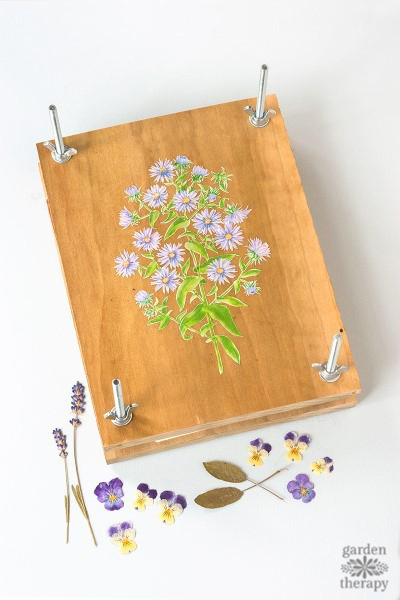 After my flower press was assembled, I decided to decorate the top with a botanical illustration I found in an old book. I used an x-acto knife to carefully cut out the flowers. Once cut out, I sprayed the back with adhesive and placed it onto the press. Next, I coated it with a few layers of modpodge and gave it a final spray of clear acrylic sealer to give it some extra protection.